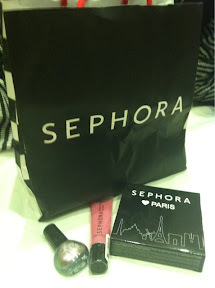 Man, I miss Sephora! Subject to a couple of caveats – more about which later – I wish they’d bring it back to the UK, I think the time is right, and the market is more than ready this time around. But, as Sephora has seemingly no plans whatsoever to bring Sephora back in the near future, I thought that I would do my part and bring a little bit of it back for my readers! There is a duochrome nail varnish (dupe for Deborah Lippman’s Wicked Game/OPI-Katy Perry Just Like The Movies), a Sephora lipgloss in Ballerina Pink and an exclusive Sephora “Paris” palette which includes four lip colours, a blusher and nine eyeshadows. Plus, in the bag you see above are a couple of other bits and bobs for you as a mystery bonus! All you have to do to win the Sephora goody bag is to leave me a comment on this post, (alongside a valid email address) and let me know which brands/products you’d like Sephora to stock if/when they do come back to the UK. I will make the draw next Sunday (5th June – where on earth has this year gone?) and contact the winner the same day. Usual rules apply – editors decision is final etc. Previous Post Bioderma Crealine Winner!